People with severe and profound intellectual disabilities should have the opportunity to receive psychoanalytic psychotherapy to deal with their emotional suffering. However, their needs are not always considered. 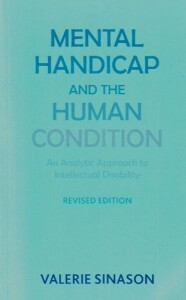 This book is not only about the people officially designated intellectually disabled, but it is also about the ways in which all of us suffer from the limitations which can be discerned from clinical work on the inner world of these individuals. This book provides detailed case accounts that show the ups and downs of the therapeutic process, particularly when dealing with these handicapped individuals. Based on more than 30 years’ of practice in the field, this stimulating, innovative, and very moving revised edition examines questions of loss, bereavement, sexual abuse, and the process and meaning of thinking. Many people wondered what actually happened in a therapy session. This landmark book by Valerie Sinason was one of the first to provide verbatim accounts of therapy sessions.